Rich in its sultry, evocative and seductive charms, Getintothis’ Paul Higham embraces the sensory delights of Midnight in Manhattan’s Travelogue EP. Sometimes music is more than, well, the sum of its parts. It has the power to stir memories, to conjure images and to engage beyond our aural senses. At its best and boldest, it can do all this without any lyrical adornment. Music has the ability to paint a picture and provokes emotions in a way that words are too often unable. Liverpool songwriter John Jenkins‘ new instrumental project, Midnight in Manhattan, is striking in its confident ambition. His EP, Travelogue, feels not so much a reportage on a trip undertaken but an invitation to share the journey. Opening song Midnight in Manhattan is a seductively beautiful and measured evocation of Manhattan. From the opening bars you are transported to a late night jazz bar: you can almost feel the sultry warmth, taste the suffocating humidity and smell the ink-blue eye-stinging smoky haze. That said, perhaps it looks towards a New York that doesn’t really exist, that never existed. It presents a romantic image cultivated perhaps by the representations of the city in film and literature. We’re lazily thinking of the decadence of Gatsby and the hotel bar elegance of Mad Men. It’s the Manhattan you think of when you close your eyes but never come close to realising when you visit. The piece brings with it a dollop of mystery as a gentle opening gives way to brooding electronica and an array of percussive delights while the jazz-inflected tones never feel too far away. With its shifting moods, changes in textures and its hints of unexplored exoticism it’s the one to which we’ll most likely return. Europe is represented through the perfectly realised Parisian café mood music of Promenade before we are shuttled transatlantic with Evenings in Manhattan a gently swinging jazzy number underpinned by a subtle yet persistent beat. It is hopeful, optimistic and full to the brim in eager anticipation. What separates this from the ordinary is its ability to conjure such vivid imagery and to awaken your senses. It bristles with an ardent humanity, capturing the sound and smells of a city full of life and vitality. It feels like a labour of love: a love of travel, new experiences and a celebration of human integration and music as a unifying force. John Jenkins, Midnight in Manhattan: Travelogue E.P. E.P. Review. Manhattan, even the merest taste of it on the tongue is to invite the strangely familiar and yet thoughtfully exotic, especially if of a certain generation or perhaps of a disposition towards the love of the city of New York and its boroughs. It is the thought of the busy, of the cool and aloof, of the sounds, smells and sights of a city that sits so comfortably in the thoughts of many, that to be there is only a film or American television programme away. It is to be in the city that never sleeps, it is not just a Frank Sinatra song framed in the mind, it is a destination that is just keeps on at you to be within, Midnight in Manhattan, to bathe in moonlight of a 77th Street Jazz serenade is to be live. For John Jenkins, Midnight in Manhattan: Travelogue E.P. bathing in the thought of the cultural hub of America, is just a step to passing on that thought of getting a taste of life from every available passing person in the street. The densely populated but exiting fumes of another soul and the sheer overload of the sensory; regardless of whether you have been before and sampled the trade, consumerism and sophisticated ethos that seeps out of every brick and reflects back from every window, or whether it remains a fantasy, an elusive shimmering lamb like figure beckoning you to take it all in. John Jenkins gives it all on a plate, a small bounty in which to sample and the taste is wonderful. The E.P. is a love letter, sent first class and stringed with admiration, the best type, that that has inspired to be more than you were, to come back changed in your outlook; travel broadens the mind, music has the ability to strengthen the resolve and both aspects have the combination of making peace with the soul. Throughout the four songs that fill the E.P. to bursting point, that sense of the idol, of seeking to be more than people ever believe you to be, is rife and placed with immense satisfaction in the instrumental musings. From the title track, to Travelogue, the beautiful Promenade and the tranquillity on offer in Evening in Manhattan, all is given room to breathe and feel expansion but seen through the eyes of someone not of its shores. For that is the point, the welcome that the bedraggled, the cold, poor and hungry yearning to escape their own tyranny in 19th and 20th Century, remains a dream for many and if you can’t get there, then the only reasonable thing to do is to live it, with every available sound and reflected thought possible. Midnight in Manhattan: Travelogue E.P isn’t a passing fancy by a writer of prose setting a scene, it is the genuine appreciation for a sound that nestles in the very heart of desire, a beating confession of admiration that sings with every fibre possible. 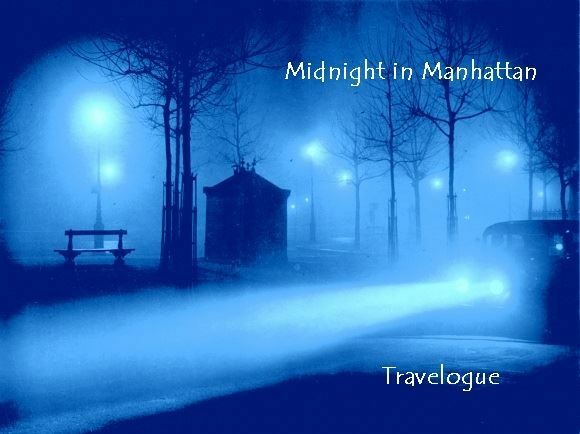 Midnight in Manhattan-Travelogue E.P. is available as a free download from www.johnjenkinsmusic.com or for £2.99 as a physical copy (Inc P&P) in the U.K. The E.P is free with any purchase of John Jenkins and That Sure Thing C.D. Intruders. Tags: John Jenkins, Midnight in Manhattan: Travelogue E.P. E.P. Review. An instrumental music project from Liverpool Songwriter John Jenkins that fuses elements of late night Manhattan Jazz clubs, Parisian Café Life, Manhattan Latino, A taste of the Orient and where Tangerine Dream meets Mike Oldfield and Electronica meets the Acoustic - all in 4 tracks. Good news - Artwork approved by Discuss group and master copies of recordings on their way to be pressed up -Tracks on Soundcloud and website for free download - Glad these song will soon be out there.